By John J. Raspanti, Doghouse Boxing: Tomasz Adamek will be at least a 7-1 underdog when he steps into the ring to face WBC heavyweight champion Vitali Klitscko on September 10 in Wroclaw, Poland. Although rarely fighting in his homeland, Adamek is a huge star with tremendous support. A capacity crowd of 44,000 is expected at the new Sadion Miejsi. Long odds are nothing new for the iron-chinned Adamek (44-1, 28 KOs). He won the light heavyweight title over favored Paul Briggs in 2005. He lost the crown in 2007 to Chad Dawson, and then claimed the cruiserweight title in 2008 with a hard fought majority decision over champion Steve Cunningham. The 34-year-old Adamek defended the title twice before relinquishing it to fight Andrew Golota in an all Poland grudge match. His victory over Golata (TKO5) earned him the IBF heavyweight championship. Adamek is a small heavyweight, standing 6’1" and weighing around 215 pounds, but he did manage to vanquish bigger fighters Jason Estrada, Chris Areola, and Michael Grant. His last fight was an easy victory over Kevin McBride who outweighed him by a whopping seventy pounds. Klitschko stands 6'7 in his stocking feet and looks even taller when he pumps out his immense jab. 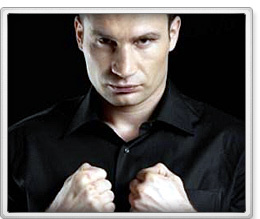 Can Adamek do what only two men before him have done and put an "L" next to Vitali Klitschko’s name? Klistchko (42-2, 39 KOs) captured a portion of the heavyweight crown in 1999. "Dr. Ironfist" shockingly lost the title when he quit against Chris Byrd in 2000. In 2004, he acquired the WBC heavyweight championship with a 8th round stoppage of Corrie Sanders, also avenging an earlier defeat to younger brother, Vladimir. The champion shocked the boxing world by announcing his retirement after defeating Danny Williams in December of 2004 due to injuries. He dabbled in politics and rested before he returned to the squared circle in 2008, winning the WBC championship again with a impressive victory over Samuel Peter. He has since defended his title six times, with victories over Juan Carlos Gomez, Chris Arreola, Shannon Briggs, and Odlanier Solis. Klitschko knows that Adamek is motivated and focused, and will definitely come to fight on September 10. "He's (Adamek) not an easy opponent-good technique, good condition, and a big heart to boxing, strong character and a strong desire to win,"said the champion. “Those are the most important elements in boxing." Klistchko has a big advantage in height and reach (six inches) as well as experience in big fights. Adamek is well aware of the size difference but feels that the 39-year-old champion is getting a bit long in the tooth. Old or not, Adamek’s only hope for victory is to out last Klistchko. He’s a gritty, determined fighter who won’t stop trying. He needs to use his footwork and mobility and make Klistchko come to him. Klitschko’s heavy pole-like jab will find it’s target as well as his right hand. If Adamek can weather the storm and counter, he might be able to make the fight more then just competitive. Adamek has a pretty good right of his own but can he hurt the champion? Klistschko's strong chin withstood some powerful rights against Lennox Lewis in 2003 and has barely been touched since. In the long run though, Klitschko’s physical advantages will likely be too much for the gutsy Adamek to overcome. Even if Adamek is executing his game plan perfectly, Klistchko could become even more aggressive and make the challenger fight his fight. If he mixes it up and starts connecting with his powerful right, even the granite chinned Adamek could be in trouble. Vitali Klitscko will continue his heavyweight reign by either stopping Tomasz Adamek late or winning a wide decision.